Yankee ireland Vouchers, Discount offers and Free Gifts in April 2019. Redeem a Yankee ireland Voucher from voucher-code.ie and get your benefit at yankee.ie. Never miss again a Yankee ireland voucher or sale offer! 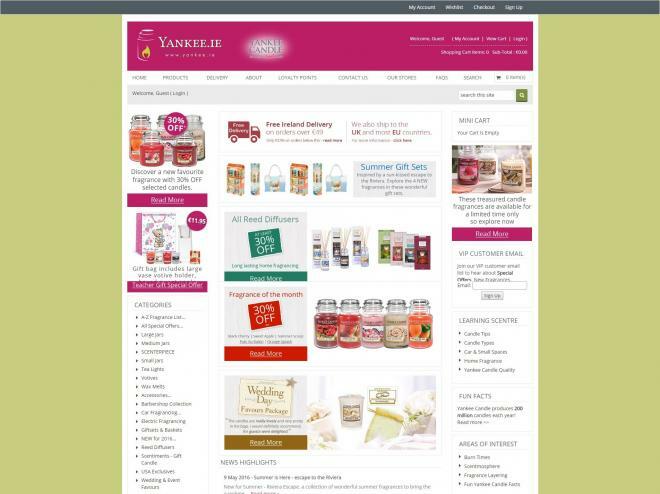 Yankee.ie is Ireland's online Yankee candle specialist. They are a family owned independent retailer and trade online as Yankee.ie and they also has Yankee Stores in Naas (Toughers Business Park). Waterford (Tramore Road) & Killarney. Unlike other online stores who see online as a small addition to their retail store - Yankee specialise in online sales with dedicated staff, picking systems and stock separate to their stores. At Yankee.ie, you don't have to wait until something is transferred from a branch. They're experts on the products they sell, having been the first retailer in Ireland to sell Yankee Candles in 1999 when they operated the Special Days store in Liffey Valley. Their staff learn about fragrance and how fragrance works with mood and senses. They carry large stock of products. 95% of the 800+ items listed on the website will be in stock and orders are usually shipped within 24 hours for following day delivery nationwide. You'll find that at Yankee.ie and Yankee Store, they will treat you like a customer, not a number. The way a customer should be treated. The way it used to be. They'll always be courteous, they'll always be on hand to help and they'll always do their absolute best at all times. That's probably why they have won Retail Excellence Ireland online awards for excellent customer service three years running! If you still are in anyway concerned about buying online, Yankee has three physical stores around Ireland. They are located in Naas (Toughers Business Park). Waterford (Tramore Road), & Killarney (Deerpark Centre). They dispatch from their head office in Toughers Business Park, Naas. All their stores are open 7 days a week and they put pride in the service levels our staff offer their customers.